The imagination is the most terrifying place of all. It generates maniacal boogeymen out of distant sounds; unfathomable nightmares out of obscurity. This is why horror, especially in an optical medium, is most effectually drawn from what is left in the darkness. Daniel Myrick and Eduardo Sanchez provided brilliant proof of this with their ground-breaking, $60,000 budgeted psychological terror fabrication, The Blair Witch Project (1999). It was a marvel in this artistic department. Such a sensation was propelled by its insistence on letting the slowly unraveling minds of its three central figures, Heather (Heather Donahue), Josh (Joshua Leonard) and Michael (Michael C. Williams), augment this already hypnotic susceptibility. This aspect only accrued as they all found themselves lost in the indistinguishable surroundings of The Black Hills near Burkittsville, Maryland in 1994. To its continued credit, Myrick and Sanchez’s debut presentation was a stroke of genius in its marketing. The same could be said for the rarely used, at least at the time, found footage motif. A web site for the big screen arrangement (http://www.blairwitchproject.com/), which now advertises the new movie, aided in swaying audiences to believe what they were viewing was real. This was with announcements of the leads of the endeavor being declared missing. The sheer authenticity visible in every frame of the 81 minute, Haxan Films construction did little to dissuade this belief. After uncountable imitators’ dabbled in this sub-genre, fellow cinephiles have been showing fatigue for the gimmick Myrick and Sanchez made so instrumental in contemporary attempts at trepidation. The hurried sequel, Book of Shadows: Blair Witch II (2000), didn’t even try to duplicate Myrick and Sanchez’s triumph. This was most accurate in these previously stated arenas. So after a sixteen year absence, director Adam Wingard and scripter Simon Barett, who have teamed up previously on You’re Next (2011) and The Guest (2014), have successfully given the once dormant series the addition it needed. This is with the third installment in the franchise, Blair Witch (2016). Wingard and Barett return to the roots of the commencing undertaking. This is by bestowing its evidence with conviction. Such is also unveiled in the gradually unnerving manner we have come to expect. This is in a modus which, parallel to the initial opus, forces patrons’ minds to fill in the blanks. It demands that the viewers become one with what is on-screen. Yet, there is a downfall to the 89 minute picture. This is that the piece isn’t as confident in itself and its spectators. There is significant emphasis on sudden, head-splitting crashing noises. These mechanize better than expected in execution. Regardless, they retrospectively come off as a cheap stab at suspense building. The episode is also watered down by an onslaught of garden variety jump scares. This is especially perceptible in the first half. Such is a sad replacement for the subtle, proficient, psyche-bending shock of The Blair Witch Project. The Lionsgate, Room 101, Snoot and Vertigo Entertainment release, on this occasion financed at $5,000,000, is weighed down by the overwhelming impression projected onto uncountable developments. This is that a lingering feeling of déjà vu hangs over much of what we encounter. Such is noteworthy in its insistence on reconstructing many of the iconic events from The Blair Witch Project. This transpires repeatedly in its inaugural thirty-five minutes. Likewise, the final twenty-five minutes, though tense and intriguing, showcases the identical destination as Myrick and Sanchez’s tour de force. Such deflates much of the nail-biting and unexpected elements that made the end of the aforesaid effort so genuinely chilling and memorable. In comparison to the sparse several minutes that posed the finale of Myrick and Sanchez’s creation, Wingard’s climax is overblown. But, it never feels that way. It gives us an extended chance to explore this ethereal, haunting, yet simple, setting The Blair Witch Project introduced late in its last act. Though the ultimate fate of our chief players foreseeable from a title card early on, we are constantly permitted to be one with, and undergo, what the protagonists are enduring. Most enthrallingly, it gives us an opportunity to explore these familiar surroundings deeper. This certainly is in its favor. It also benefits Wingard’s affair. This is in becoming simply a pale imitation of a vastly superior model. These moments are certainly deftly crafted. Such is the case with the notion of time manipulation and disorientation. It allows us to analyze certain sequences in The Blair Witch Project in a different light. Such also brings forth a whole array of fresh inquiries into what exactly is going on. This makes the primarily overwhelming belief that this is as much a carefully packaged remake as it is a supplement easily fade. Such occurs when we see what Wingard and Barett are doing with the material. The several fascinating twists, and the induction of different notions which occur largely in the second act, assist in making for a follow-up that is stronger and bolder than anticipated. The narrative is admittedly thin. The flick opens with the ill-fated heroine of the foremost venture, Heather, being spied in an online video by her brother, James (James Allen McCune). This exhibits that which closed Myrick and Sanchez’s exercise. Trusting this is a sign that she may still be alive, James rounds up a crew of individuals. They want to document his trip to find his sister. These are Lisa Arlington (Callie Hernandez), Ashley (Corbin Reid) and Peter (Brandon Scott). Those responsible for putting the recorded material which heralded this journey on YouTube, Lane (Wes Robinson) and Talia (Valorie Curry), eventually meet the group. Soon the presence of the title character is noticeably felt. Our amateur documentarians discover themselves running into the problems which gripped those in Myrick and Sanchez’s outing. This quickly spirals out of control. They frantically utilize the HD cameras, iPads, GoPros and even the drone they brought along (which is pivotal in an unusually frightening instance at about the 2/3 mark involving the climbing of a tree), to capture and understand the increasingly bizarre measures as they unfold. But, it isn’t long before they uncover that their technical prowess is no match for the wickedness they disclose. All of the enactments are fair and watchable. But, the human entities that populate what we see in Blair Witch are all one-note stereotypes. In modern fashion, they are merely potential victims. They are treated like pawns. All of whom we hardly get to know before The Blair Witch begins her systematic slaughter. None of the everyday realism engraved into the charismatic personalities in Myrick and Sanchez’s classic are evident in any shape or form in Wingard’s undertaking. Their motives are equally rote. Because of this, they are largely predictable. This also hurts the composition. Such is distinguished when the dreadful circumstances begin to unfurl. This is because we don’t care for them above the garden variety genre personality. The dialogue, and the story arc itself, courtesy of Barett trails suit with the average, commonplace excursion into fear. Still, Barett’s screenplay takes chances, issues sufficient innovative thoughts (particularly in the second act), and offers some genuinely surprising twists. In turn, Barett moves the narrative onto its own path respectably. Wingard’s claustrophobic, immersive behind the camera flare is undoubtedly the impetus of the photoplay. He knows how to erect a startle. Even the most tired ones appear vigorous and novel. There is a wall of intensity he victoriously instructs. It is one which is largely unwavering throughout most of the production. 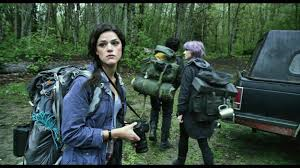 But, unlike Myrick and Sanchez’s contribution in The Blair Witch Project, Wingard makes the proceedings seem a bit too comparatively artificial, false and photographic. The positive nature of these qualities are all greatly heightened by Robby Baumgartner’s sharp, lush cinematography. Louis Cioffi’s editing is stalwart. That is if you can accept the obvious faults inherent in this section from its primary conceit. Wingard’s music is appropriate and evocative. Kate Marshall’s set decoration, Sheila Hailey’s art direction, Hayley Miller’s make-up and Katia Stano’s costume design all fare as well. The special and visual effects, a combined involvement from a half a dozen personages, are vastly plausible and impressive. 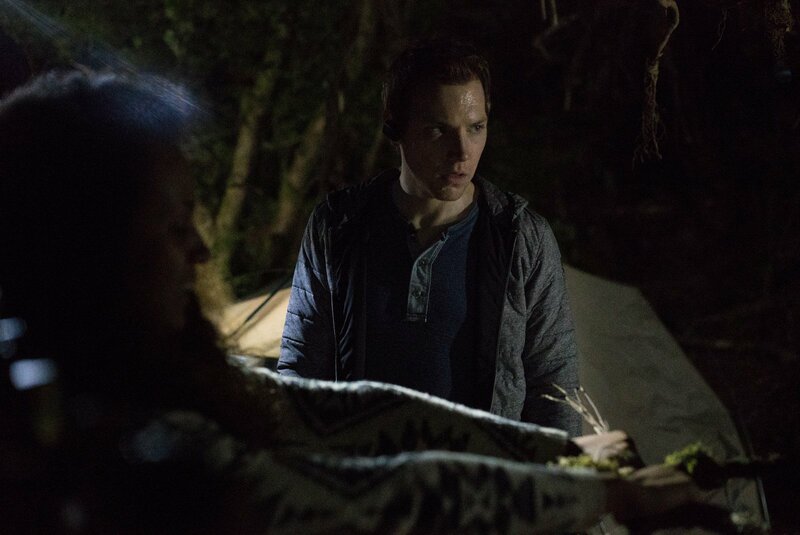 Blair Witch, formerly called The Woods, can be straightforwardly coined: “a true extension of its source material.” It re-introduces much of what we learned prior interestingly enough via casual conversation. This never feels forced. Yet, it expands this data, and the general mythology itself, with further details about the protagonist of the tale. Such will guide those who have not yet experienced Myrick and Sanchez’s masterpiece. This is while operating as a pleasant reminder to those who have seen the arrangement. Those who expect to be as thrilled, and view something as inventive as The Blair Witch Project, may be disappointed. Wingard and company spend too much of the bulk tracing the footsteps of Myrick and Sanchez’s introductory chapter for such an accomplishment to take flight. Moreover, the novelty of the concept has run its course. Yet, those of us who are willing to accept this and overlook these shortcomings should be satisfied. This is in favor of a few beautifully honed jolts and a correspondingly alluring aura of ever-mounting dread. Others may want to simply re-watch the original with the lights off and the volume turned up. In so doing, they can fully recall the full degree of fright they once felt.